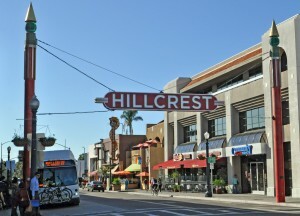 Hillcrest is a lovely neighborhood located near the center of urban San Diego. 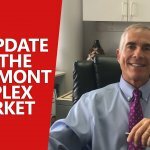 It was developed in the early and mid-1900s to meet increasing demand for real estate near the flourishing Downtown district. As you enter below its iconic neon “Hillcrest” sign, you’ll find streets dotted with trees and filled with great restaurants and specialty shops. To browse Hillcrest San Diego homes for sale, please view our Hillcrest Real Estate Listings. The restaurants in Hillcrest are some of the best in San Diego. Amarin Thai, Kous Kous, and Yakitori Yakyudori offer delicious Thai, Moroccan, and Japanese cuisine, respectively. Bronx Pizza serves up giant thin-crust slices, while Hash House A Go Go and the Tractor Room offer classic American fare with a twist. Bars and nightclubs are also a staple of the area. The Gay Pride Parade and the CityFest street fair are two major events held annually in Hillcrest. Just to the south is the captivating Balboa Park, which contains the San Diego Zoo, numerous museums, a few theaters, and other activities. The Mission Valley and Fashion Valley malls are also located just north of the area. Hillcrest is densely populated with a high proportion of unmarried individuals, and is home to an active gay community. The 8 and 163 Freeways are close by to take residents anywhere they need to go. The surrounding neighborhoods of Hillcrest’s small, inexpensive apartments are best suited to those ready to be immersed in a thriving local culture centered around food and art. To learn about Hillcrest homes for sale, Hillcrest real estate listings, and homes and real estate in other communities near Hillcrest, please return to our Central San Diego page. For advice on selling your Hillcrest home, visit our Seller Resources page. 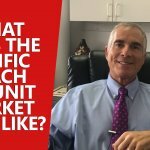 For tips on buying a Hillcrest home or other San Diego real estate, visit our Buyer Resources page. Hillcrest homes for sale and Hillcrest real estate listings are found here for those looking for homes for sale and real estate for sale in Hillcrest San Diego.